Includes one ink cartridge and 100 sheets of 4 x 6 photo paper. 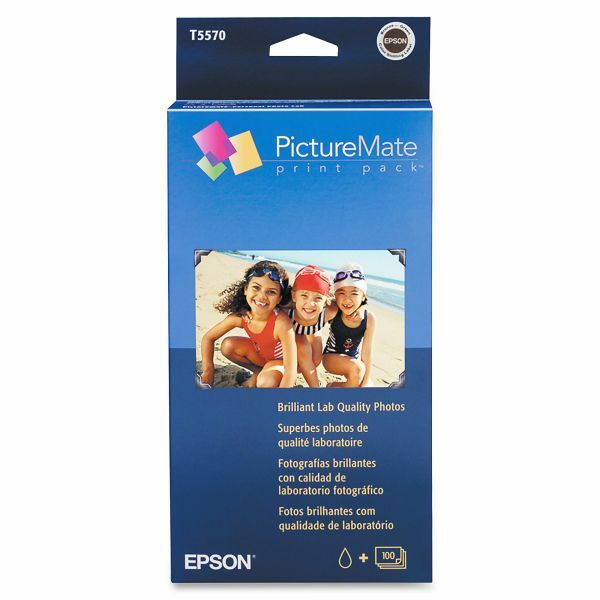 PictureMate™ Photo Inkjet Printer (EPSC11C556001), sold separately. Brilliant Lab Quality Photos At Home. Everything you need for 100 beautiful 4x6 photos at about 29 cents per print. 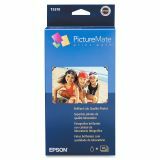 Epson Color Print Cartridge & Photo Paper Kit for PictureMate - The PictureMate Print Pack includes 100 sheets of 4 x 6" glossy PictureMate Photo Paper and a photo cartridge for printing about 100 borderless 4" x 6" color photos. Allows you to print photos easily when and how you want in the convenience of your own home or office. Offers longer durability, with prints resisting fading as much as two to four times longer than the leading brands of photo lab prints and other dedicated 4"x6" printers." Photos resist fading up to 2 to 4 times longer than photo lab prints.